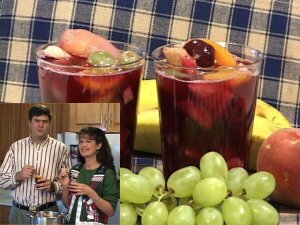 See the video of Dan and his sister, Teri, making Grandma Oaks' family-favorite Fruit Cocktail. Click here (56k) to watch the video. If you have a high speed connection, click here (300k) to see a higher-quality video clip. Add jello to boiling water and mix until completely dissolved. Remove from heat and pour into a large cooking pot or punch bowl. Next, add all the fruit and mix it up, and you're ready to serve. Do not drain any of the liquid. Quantities for the fruit vary depending on the size of crowd you're serving. Grandma Oaks always made this in the biggest cooking pot she had! It makes a lot so you might consider cutting cutting the recipe in half.